In July 2014, weeks after overrunning Mosul and much of Iraq’s Sunni Arab heartland, IS militants rigged the shrine and blew it up, sparking global outrage. In mid-January, Iraqi troops in Nineveh liberated the site. But IS also dug tunnels beneath the shrine searching for artifacts to plunder. However, IS plundered many of the items that were in the palace. Khalaf estimated that more than 700 items have been looted from the site to be sale on the black market. The full story has more sad news. The Vatican and the Jewish community of Rome are collaborating on a new exhibition on the menorah. Whenever Mosul is liberated from ISIS, a strategic plan will be in place for restoring its heritage. Restoration work is underway on a colossal statue of Rameses II that once stood in the Karnak Temple. Israeli border officials caught a Palestinian smuggler bringing in 53 ancient coins from Jordan. Digital Giza is a virtual 3D model of the Giza Pyramids, and includes information about the history and archaeology of the site. In an excerpt from his latest book, Eric Cline compares the archaeology of Masada with Josephus's report and identifies discrepancies. Among his conclusions is that Josephus made up the story of the mass suicide to protect the Romans. The updated Appian Media website has all 5 free episodes of “Following the Messiah” as well as a new subscription area with additional video clips and photographs. Wayne Stiles visits the famous Cave of Machpelah in Hebron to see what it teaches about life, death, and God’s promises. Ferrell Jenkins posts on several interesting ossuaries. See also a link in the comments to two of Tom Powers’s articles on another ossuary probably related to the New Testament. Tabgha's Church of the Multiplication of Fish and Loaves has re-opened after 20 months of restoration following the arson attack. Hebrew inscriptions discovered on a Roman-period capital point to the Jewish history of the Druze village of Pekiin. The oldest known sickle blades have been discovered on the shore of the Sea of Galilee. Archaeologists working at Omrit have discovered a house decorated with frescoes dating to circa AD 100. Robert Cargill suggests that "Cave 12" provides evidence that parchment was produced at Qumran. Israel's Culture Minister has offered to trade two elephants to Turkey in exchange for the Siloam Inscription from Hezekiah's Tunnel. Israel’s Good Name describes a morning hike in the Ramot Forest on the north side of Jerusalem where a herd of gazelles live and a wild boars were recently spotted. Carl Rasmussen shares a photo of a mosaic depiction in Berea that shows Jesus climbing a ladder on to the cross. The Temple Mount Sifting Project blog gives the back story on Zachi Dvira and how he came to direct this important project. The map is noteworthy because the Ancient World Mapping Center has reconstructed the ancient coastline, most notable at places such as Miletus, Ephesus, north of Smyrna, and between Xanthos and Patara. The map shows Roman roads, bridges, quarries, and aqueducts. It also shows rivers, wetlands, and elevation with subtle hillshading. According to the legend, the map includes mountain passes and shrines, though I noticed only one of each. Yesterday, I could download the map directly, but as of today you have to email the Ancient World Mapping Center for a download link. The TIF file I downloaded is a whopping 1.72GB! If you were to print the map at 300dpi, the sheet would measure 80" x 50". (To download a JPG version of the map at about 100MB, use this temporary link.) The map is licensed under CC-by-4.0. 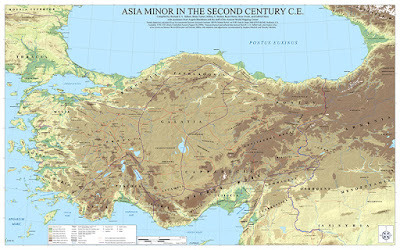 This map is the latest creation by the Ancient World Mapping Center in a line of cartographic products which includes the Barrington Atlas of the Greek and Roman World (print and digital), Benthos Digital Atlas of Ancient Waters, the AWMC à-la-carte Map, and the Routledge Wall Maps for the Ancient World. I’ve mentioned before “Paul’s Walk from Troas to Assos” tour that is being led by Mark Wilson and Meg Ramey. I think it will be a fantastic trip because not only will you see many important sites in western Turkey, but it is rare to have the opportunity to experience the land by an extended walk that follows in Paul’s footsteps. I’ve just learned that scholars and pastors qualify for a 50% discount on the trip. Whether you’re in that category or not, I think the trip will be extremely worthwhile. I have traveled with both Tutku Tours and Mark Wilson and they are top-notch. The walk is about 30 miles (48 km), spread out over three days. They have a bus that will provide transportation for any not up to walking all of it. Here’s the link for the itinerary and brochure. The dates are May 20 to 31 and the deadline for signing up is soon. I took the three photos below on my trip to Turkey last month. I imagine the scenery will be even more beautiful in the spring. The search for hidden chambers in King Tut’s tomb continues this year. A Japanese team has discovered the tomb of a royal scribe of Amenhotep III. Ferrell Jenkins has posted on an attractive display of ossuaries at the Hecht Museum in Haifa. Seth Rodriquez explains what happened to Judah after they were exiled. Thomas Kiely of the British Museum reviews The Oxford Handbook of the Archaeology of the Levant c. 8000-332 BCE in the Oxford Handbooks in Archaeology series. On the ASOR Blog, Anna-Latifa Mourad argues that the Hyksos were foreigners but not invaders. Since 1833 there has been no mosque in Athens. Until this year. Daniel Falk will be lecturing on “The Myth of the Dead Sea Scrolls” at Baylor University on Tuesday, February 21. Alexander Schick will be lecturing at The Jordan Museum in Amman on Thursday, February 23, 5:00 pm, on “Uncovering the Scrolls: The Early and Late History of the Dead Sea Scrolls.” All are welcome. A Roman-period gate has been discovered at Beit Shearim (“house of gates”). A preliminary report from the 2016 season at et-Tell (Bethsaida?) is now up at The Bible and Interpretation. A man who fished a Persian-period amphora out of the sea at Ashdod has turned it over to authorities. I enjoy seeing my photos (especially of more obscure sites) put to good use, and no one does it better than Wayne Stiles. This week he ventures over to Ein Parath. Lawrence Schiffman has written an article for Ami Magazine on the discovery of Qumran’s 12th cave. Liberty University has a story on their role in the Qumran excavations. Gordon Govier talks with John DeLancey about Qumran Cave 12 and upcoming excavations in Israel on this week’s edition of The Book and the Spade. Is Genesis History? is a new documentary showing on theaters on Thursday, February 23. I’ve heard good reports from those who have seen it. The shrinking Dead Sea is a perennial news item, but The Times of Israel’s article today has some new information on the subject that I haven’t seen in previous reports. There’s also a 360-degree-video taken from a boat moving along the shore. The explosion of sinkholes from 100 to 6,000 in the last 25 years. The closing of multiple tourist spots along the shore. The reduction of the Jordan River to 5% of its original flow. How fresh water coming from the mountains creates the sinkholes. Israel’s increase of water released from the Sea of Galilee from 9 to 30 million cubic meters in the last 4 years. The debate about how the mining industry contributes to the problem. How Einot Tzukim is fighting to stay open for tourists. The upside of the highway bypass at En Gedi. One scholar’s proposal for an “open geological park” to enable visitors to view the sinkholes. Why another scholar believes the sinkholes are good. This well-illustrated article written by Melanie Lidman is here. In light of the recent revival of the half-shekel temple tax, John Delancey looks at the biblical background of this coin. Wayne Stiles shows how the Hinnom Valley is not only a picture of evil, but also one of redemption. And, as usual, he shares some great visuals. Ferrell Jenkins has created an index of his articles on the Romans and Jesus’s ministry. If you’ve ever wondered what the building looked like from which Eutychus fell out of the window, Carl Rasmussen has an idea. Where did Jesus speak the words of John 15-17? Leon Mauldin looks at the options. Juliette Desplat describes the history of the Philae island and temple that were partially submerged for years before the temple was relocated. The Met has moved its large image collection from OASC to public domain. Free article from BASOR this week: “Back to Solomon’s Era: Results of the First Excavations at “Slaves’ Hill” (Site 34, Timna, Israel),” by Erez Ben-Yosef. Excavations are set to resume at Masada, and the focus will be on Herod’s gardens and the rebels’ houses. Tel Aviv University will begin excavations at Kiriath Jearim this August. Craig Evans discusses the new DSS cave find and shares with readers the insights of Randall Price. The article includes a picture of the 12th cave's location. Some scholars are claiming that any future finds relating to the Dead Sea Scrolls belong to Israel. The latest discovery, with the blank scroll parchment, may help to detect modern forgeries. The Oriental Institute Museum has made available an Ancient Near Eastern Cross-Cultural Timeline. The Steinsaltz edition of the Talmud is being published online and will be available for free in Hebrew and English. This joins an already extensive collection of Jewish texts at Sefaria. "This exciting excavation is the closest we’ve come to discovering new Dead Sea scrolls in 60 years. Until now, it was accepted that Dead Sea scrolls were found only in 11 caves at Qumran, but now there is no doubt that this is the 12th cave,” said Dr. Oren Gutfeld, an archaeologist at the Hebrew University’s Institute of Archaeology and director of the excavation. “Although at the end of the day no scroll was found, and instead we ‘only’ found a piece of parchment rolled up in a jug that was being processed for writing, the findings indicate beyond any doubt that the cave contained scrolls that were stolen. The findings include the jars in which the scrolls and their covering were hidden, a leather strap for binding the scroll, a cloth that wrapped the scrolls, tendons and pieces of skin connecting fragments, and more." The press release includes the photos shown below, all courtesy of Casey L. Olson and Oren Gutfeld. The story is covered by the Jerusalem Post, Haaretz, and The Times of Israel (briefly). Navigate around a blank base map of the biblical world. Enter the name of a biblical site and it will appear on the map. You could try Shechem, Lachish, or Capernaum. Choose a biblical passage and all sites mentioned in it will show. You could try Joshua 6-8, Mark 1-2, or Revelation 2-3. Select another webpage and it will map all biblical sites on that page. Try, for example, the Sea of Galilee page at www.LifeintheHolyLand.com. Add roads from the OT or NT periods. In my testing, the maps load quickly and the sites are identified accurately. A time or two I had to refresh the page, perhaps because I had too much data. This new tool is different from the original Bible Mapper (still available in free and paid versions here), which allows you to save, export, and print customized maps. I could see students and teachers using this in personal Bible study as well as in the classroom. I am grateful to David Barrett for creating such a handy resource for us all. Note: See Mark Hoffman’s blog for his experience with the WebViewer. Israeli authorities seized dozens of stolen ancient artifacts in Acco recently. January’s “Find of the Month” for the Temple Mount Sifting Project is a murex trunculus. Wayne Stiles considers the history and geography of Bethsaida and makes a present-day application. Philippe Bohstrom looks at the history and biblical connections of the Amorites in the first part of a series for Haaretz (premium) on the Peoples of the Bible. Yonatan Adler investigates the archaeological evidence for Jewish ritual purity in the time of Jesus, focusing on ritual baths and chalkstone vessels. The half-shekel Temple tax is once again being collected. The ASOR Archive Photo of the Month shows the excavations at Bethel (Beitin) in 1934. After decades of travel in the Holy Land, Ferrell Jenkins made it to biblical Ibleam and its water tunnel.